The string on your traditional bow is as important as the shafts or the bow itself. String selection is even more critical with a recurve (over a longbow) since there’s more string material in contact with the limb. Without the larger loop on the top, stringing your bow using a conventional stringer would be very difficult. The increased loop size allows for the string to slide over the limb in order to string the bow. The string grooves on our recurve and longbow limbs are sized to fit a variable loop string. The string grooves on the top limb are longer to accommodate for the larger loop. Vice-versa on the bottom limb/loop. The string loop sizes should coincide with the string grooves in our limbs to ensure proper limb alignment and protection. This proper fit helps the string and limbs remain in their proper place. The long string groove on the limbs are handcut at a particular size to accommodate a 16-strand string. If you shoot a string with too many strands, it will not fit properly into the groove and the integrity of your limbs could become compromised. String length is another critical consideration. Your bow’s AMO (Archery Manufacturer and Merchant’s Organization) length is marked on its lower limb. To achieve the correct brace height you will need to use a bowstring of the same AMO length. (Example: An AMO 62” bow requires an AMO 62” string). 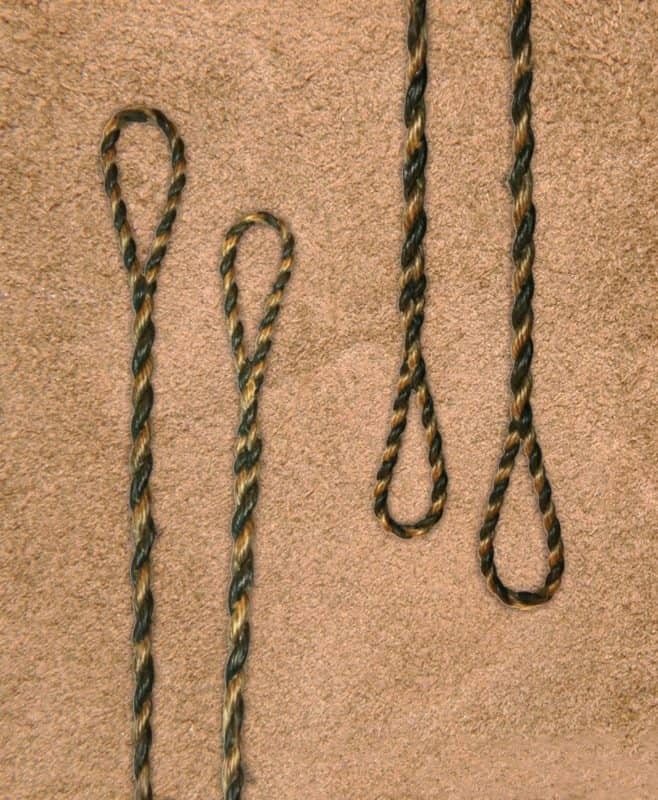 The actual length of your bowstring (depending on the material) will be 3.5”-5” shorter than its marked AMO length. When ordering replacement or extra strings for your Bob Lee Bow, we encourage you to choose carefully in order to ensure optimal performance and protection for your bow. Category: Bow Care and Maintenance, Outfitting your Bob Lee Bow | Tags: bow string, fast flight, flemish twist.